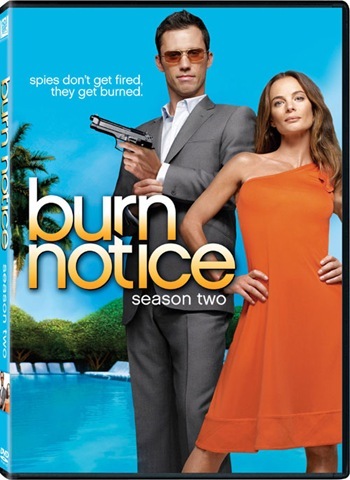 DVD REVIEW: Burn Notice: Season Two – Breezy Spycraft, Beautiful Environs and Carla! In season two of Burn Notice, Michael Westen [Jeffrey Donovan] found himself between a rock and a hard place when Carla [Trisha Helfer] began to squeeze him into taking assignments for her – forcing him to track her down and get her out of the picture so that he could return to the task of getting his burn notice pulled. Without sacrificing any of the series’ fun stuff – the MacGyver-like spycraft; the breezy narration and the camaraderie between Westen, Fiona [Gabrielle Anwar] and Sam Axe [Bruce Campbell]; the love-hate relationship between Westen and his mother, Madeline [Sharon Gless], and Michael’s Simon Templar-like helping people with their problems – creator Matt Nix and his writing team added a further layer in Michael’s efforts to get Carla off his metaphorical back. The edge that had been mostly an undercurrent on the show became much keener and came into sharper focus.